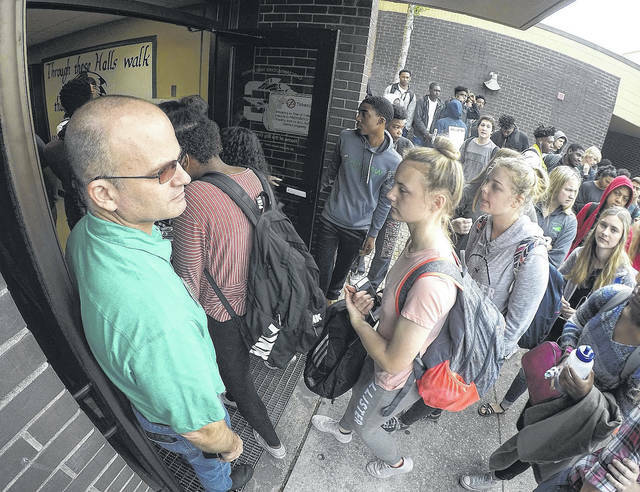 Dr. Lee Hale, principal of Choctawhatchee High School in Fort Walton Beach, Fla, holds the door for students following a 17 minute walkout staged by students on Friday, Feb. 23, 2018, to honor the lives lost from the Parkland shooting last week. “He was not a credit to law enforcement,” Trump told the Conservative Political Action Conference. Trump tailored his talking points Friday to his conservative audience, pushing the idea of arming some teachers who are “gun-adept people” but making no mention of another proposal he’s advanced in recent days that is opposed by the National Rifle Association: increasing the minimum age for buying assault rifles from 18 to 21. During a later appearance with Australian Prime Minister Malcolm Turnbull in which he again addressed gun violence, Trump declared the United States was “well on our way to solving that horrible problem” — even though the administration has yet to deliver a firm plan to Congress. His comments drew a rebuke from a top teachers’ union leader. “Denigrating the work of campus security guards is reprehensible,” said National Education Association President Lily Eskelsen García. Separately, Florida Gov. Rick Scott announced plans to put more armed guards in schools and to make it harder for young adults and some with mental illness to buy guns. He favors barring sales of all firearms to anyone under 21. Trump, long supported by the NRA, has sought to maintain his backing among gun rights activists even as he has called for strengthening background checks and raising the minimum age for certain weapons purchases. Trump has advanced a variety of ideas to counter gun violence, and the White House this week asked the Justice Department and Bureau of Alcohol, Tobacco, Firearms and Explosives for recommendations: everything from faster ballistics testing to more prosecutions for those who lie on gun background check forms. The White House has said Trump will soon lay out a package of school and gun safety proposals for Congress to consider. Democratic Connecticut Sen. Chris Murphy, an outspoken advocate for more gun restrictions after the 2012 elementary school shooting in Newtown, Connecticut, said he expected to meet with White House aides next week. “I’m here to hear the White House out,” Murphy said. If a teacher had been carrying a concealed firearm when a former student began firing at the Florida school, “the teacher would have shot the hell out of him before he knew what happened,” Trump said. Officials announced Thursday that Sheriff’s Deputy Scot Peterson never went inside to engage the gunman at Marjory Stoneman Douglas High School while the shooting was underway. Peterson has resigned. Addressing conservatives in Oxon Hill, Maryland, Trump offered a greatest-hits recap of his campaign themes during wide-ranging remarks to CPAC. He urged activists to help Republicans in the fall midterm elections. He said Republicans must not be complacent in the fall midterms, warning of terrible consequences if Democrats take control of Congress. Trump predicted Democrats would “take away those massive tax cuts,” referencing to his signature tax law signed in December, “and they will take away your Second Amendment.” Trump then surveyed the audience of conservatives on which issue was more important to them, and listened as the crowd cheered loudly in support of the Second Amendment right to bear arms. Near the end of a roughly 75-minute speech, Trump recited the lyrics from the 1960s song, “The Snake,” a campaign staple that served as an allegory to warn of what he views as the dangers of some refugees and immigrants being allowed into the United States. He reiterated his campaign pledge to build a wall along the U.S.-Mexican border and charged Democrats with failing to engage on a plan to provide protections for young immigrants, even though he ended the protection program. And he re-aired rhetoric from his 2016 campaign, citing a “very crooked media, we had a crooked candidate, too, by the way,” referencing former Democratic rival Hillary Clinton. The crowd chanted, “lock her up,” a common refrain at Trump campaign rallies. Associated Press writers Darlene Superville and Sadie Gurman contributed to this report.